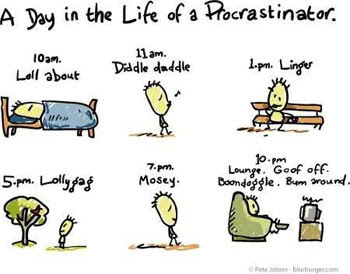 What Does Your Procrastination Say? Procrastination...we all procrastinate! Most of us beat ourselves up for it too. I’ve been doing this the past few days; I tend to feel like there is so much more I could be getting done. Have you ever done this to yourself? Have you ever thought if I only I didn’t procrastinate I’d be richer, smarter, thinner, funnier, or better in some way. Whenever I’m procrastinating David Bowie’s song “Under Pressure” starts playing in my head, it goes something like this, "Procrastination, coming down on me, crashing over me. Dee-dum, dooby-do bada, living on the streets.” Yeah, I don’t ever remember the actual words, but since we’re talking procrastination these work! Back to procrastinating…perhaps you’ve planned to complete a certain task. Maybe it’s to clean out the closet or set-up a Word Press blog. You go to your computer and get online. You have every intention of creating your blog, yet you somehow get distracted by Facebook or Twitter. Before you know it 40 minutes have passed and still no blog. Though you have managed to thank everyone for the nice comments they made about your new profile picture. In these moments I find myself grumbling and telling myself to get started already! I decided to try something different. I asked myself why I procrastinate. Try it, simply ask yourself, "Why do I procrastinate?" There’s a reason and it’s not because you’re lazy or you love how good it makes you feel to put things off one more time. I discovered I’m prone to procrastinate on projects that could cause people to take notice of me, what if people don’t like what I have to say or what if they do? What if I’m ridiculed or what if I succeed at it? Success is super scary; to me it represents new places, experiences, and maybe growth. Ask yourself why you procrastinate, what are you protecting yourself from? It might be something totally unexpected. I’ve been interviewing several people for my upcoming blog series ‘Interviews with Awesomeness.’ This series will be focusing on EFT (Emotional Freedom Technique), health, and creating more self-love, confidence & happiness in our lives. I’ve been a bit lax in setting a specific start date. With some self-questioning, tapping guidance from Carol Look, and a bit of love I have picked a date!! My ‘Unlocking Your Awesome Self & Attracting What You Want’ series will start next week on Tuesday July 30, 2013. My first interview is with the lovely Erica House a vegetarian, personal trainer, writer, marathon runner, and she also has a Master’s in Psychology. Check out Erica’s website here, and be prepared for some awesome tips and sharing going on next week! Join me on my website for more indepth info about Emotional Freedom Techniques. For other tapping videos check out my YouTube channel and please subscribe below!